Most of the prizewinners assembled in Trinity Church on Saturday to accept their trophies. Rothesay Horticultural Society held its annual flower show last weekend, giving out prizes in categories including pot plants, floral arts, baking, preserves and more. The society took over Trinity Church and its halls from Friday evening, when hundreds of entries were put on display in preparation for judging on Saturday. Mark McCormack of the Rothesay Horticultural Society accepting one of his many prizes. Members of the public took advantage of the decent weather on Saturday to browse the impressive displays of dahlias, crysanthemums and vegetables. There were also plenty of arts and crafts categories, including some for children and young people. A raffle was held offering prizes donated by society members, and the shields and trophies were handed out on Saturday by district councillor Jean Moffat. 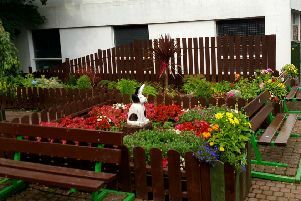 In his address the society’s chairman Frank McCabe said: “I am pleased to inform members that through the hard work of the committee, the society was able to obtain grant funding from the Lottery Awards for All Fund to ensure that the flower show will continue in the absence of the Pavilion as a venue. Some of the dahlias on display over the weekend. “On behalf of the committee I would like to take the opportunity to thank all the members who participated in last year’s show and also thank the congregation of the Trinity Church for allowing the society to hold the flower show in the grounds of the church once again. Prizewinners included: Isabel Jarvie Memorial Trophy, best vase of hardy annuals - Sue Smith; Sir Norman Lamont Challenge Trophy, most points in floral art section - Mark Crawford; Ascog Cup, best non-flowering pot plant in section - Mark McCormack; Mr & Mrs Hector MacDonald Cup, best fuchsia in section - Carol-Anne Frankland; Adams Cup, best hanging basket - Carol-Anne Frankland; Bute Garden Furniture Trophy, best planter in show - Beck Reid; Top Vase Trophy, best top vase in section - Mark Crawford; Lord Colum Crichton Stuart Challenge Cup, winner collection of vegetables - Mark McCormack; Helen Wood Challenge Trophy, best handicraft in section - Jean Muir; Chorad Cup, best exhibit in art - Anne Cassidy; SWRI Shield, best exhibit by a member of Bute Rural Institute - G Tayler; Barr Cupp, best wine in section - Frank McCabe.